Surgery often requires a patch of the dura if syringomyelia is present. Chiari malformations represent birth defects or acquired membranes that affect the posterior part of the brain: the cerebellum, which is the part of the brain that controls balance. Normally, the cerebellum is a separate brain structure at the back and bottom of the brain. Under most situations the cerebellum remains in the skull. In Chiari malformations, abnormal membranes or the lower part of the cerebellum (tonsils) herniates (squeezes) through the base of the skull. There are 4 types of Chiari malformation, listed as number 0, I, II and III. The simplest and most common is Chiari I. 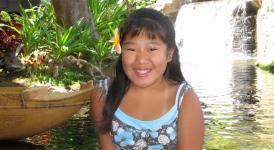 Most Chiari I birth defects are present at birth, though symptoms may not become apparent for some time, even until your child reaches adolescence or even adulthood. Chiari II and III are more severe birth defects that are associated with other brain and spinal cord birth defects, such as spina bifida, which are apparent at birth. Chiari 0 is from thin mobile membranes that can be seen only from special MRI moves that we have developed. 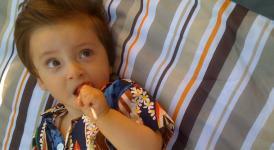 It is currently estimated that between 200,000 and 2 million Americans have the condition. Minor Chiari malformations can be a normal anatomical variant without causing any problems and the condition may be over treated at some medical centers. Symptoms occur when there is an abnormal membrane or enough herniation of the tonsils to cause pressure against the brain, or block spinal fluid from flowing back into the brain. This can also leads to the formation of a fluid cavity of the spinal cord called syringomyelia that can cause damage to the nerves of the spinal cord. When symptoms do occur, they tend to be very specific. These include pain between the back of the skull and neck (suboccipital), crooked neck (torticollis), dizziness, vertigo, disequilibrium, visual disturbances (blurred or double vision), frequent gagging and choking on liquids, nystagmus (involuntary eye movements), hoarseness, sleep apnea, muscle weakness, numbness, and painful tingling of the hands and feet. Often, the symptoms are made worse with straining. Normally, fluid is constantly circulating along the spinal cord and brain. 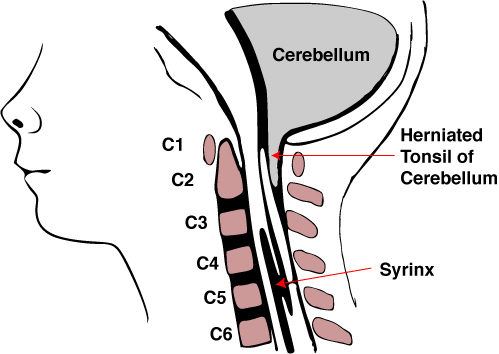 When the Chiari herniated cerebellum blocks the flow, a cavity (syrinx) can form in the spinal cord. 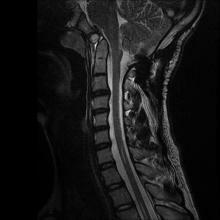 This condition is called syringomyelia. Syringomyelia can cause curvature of the spine as well as lead to further injury of the spinal cord and affect its function. The only real way to diagnose a Chiari I malformation, is with an MRI. A CAT Scan or CT scan may not show it, and a plain x-ray will never visualize the disorder. The MRI can show how much pressure the Chiari malformation is putting on the brainstem and the spinal cord. If this chronic pressure is left untreated, it can cause very serious consequences including paralysis. In addition, Chiari I malformations are sometimes associated with an unstable junction between the skull and neck and abnormal bony compression of the spinal cord. This must be recognized in order to be part of the treatment. Fast dynamic imaging technique to identify obstructive lesions in the CSF space: report of 2 cases. Wang DD, Martin KW, Auguste KI, Sun PP. Surgery is the definitive treatment. While most of the time one surgery is needed, occasionally additional surgeries may be required. There are different kinds of operations that we perform depending on the type of malformation and the extent of the herniation. The basic operation is intended to reduce the crowding around the base of the skull and remove pressure from the brain stem and spinal cord. This is done by removing a small piece of bone at the base of the skull. We may often remove a part of the back of the first vertebrae. 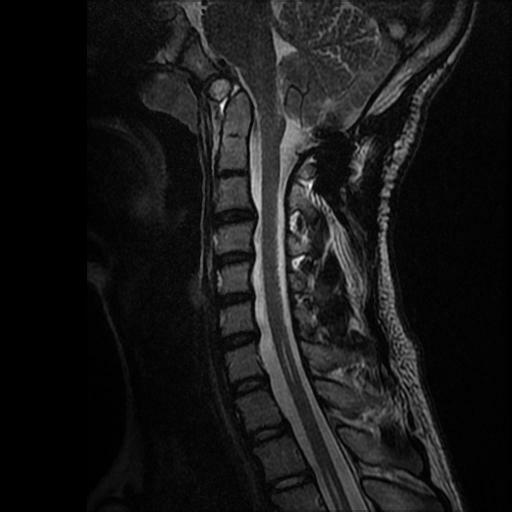 If there is syringomyelia or a syrinx, the operation usually includes patching the covering of the brain (dura) and shrinking back the herniated tonsils to increase space. If there is a thin membrane blocking normal fluid flow this must be detected and cut open. If there is an unstable junction between the skull and neck, then a fusion operation with screws and rods inserted into the bones of the neck and skull is required. The patient’s symptoms usually stabilize or resolve entirely.